Kenya is gorgeous and smart, but currently in the 42.3% of professional black women not getting married. She’s fixed up on a blind date with Brian. But he’s a white guy, and she’s a little out of her comfort zone. She wants to find a ‘brother’. But Brian chips away at her facade until she lets him in. Kenya is a beige girl – she’s very driven, but she’s also very safe, guarded and unadventurous. Brian helps her to relax and be herself, but her friends and family are not supportive of her choice. Race issues are present for Kenya and Brian every day and negotiating them is tough, too tough to make it work. So Kenya finds herself a ‘brother’ but ultimately, he isn’t the ‘one’. This is a gorgeous little film. It was subtle, yet upfront about racial discrimination and inter-racial relationships. It isn’t fancy, but it’s definitely watchable. 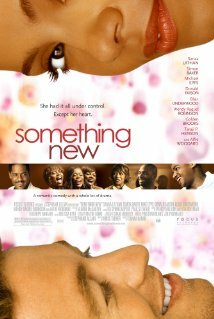 Posted on 02/08/2010, in the whole rom com list and tagged Patrick James, Sanaa Lathan. Bookmark the permalink. Comments Off on Something New.